← FOCUS…one word, express in one hundred words in one hundred days. PICTURE…one word, express in one hundred words in one hundred days. Pictures Are Life Possibility In The Unseen. Pictures Are One Of The Most Powerful Treasures In The Universe. They Stick To Memory And Remain Alive For Fulfillment. Pictures Slash Into To The Heart Like Imagination And Becomes Reality Like Magic. The Living Are Dead Without Picture. 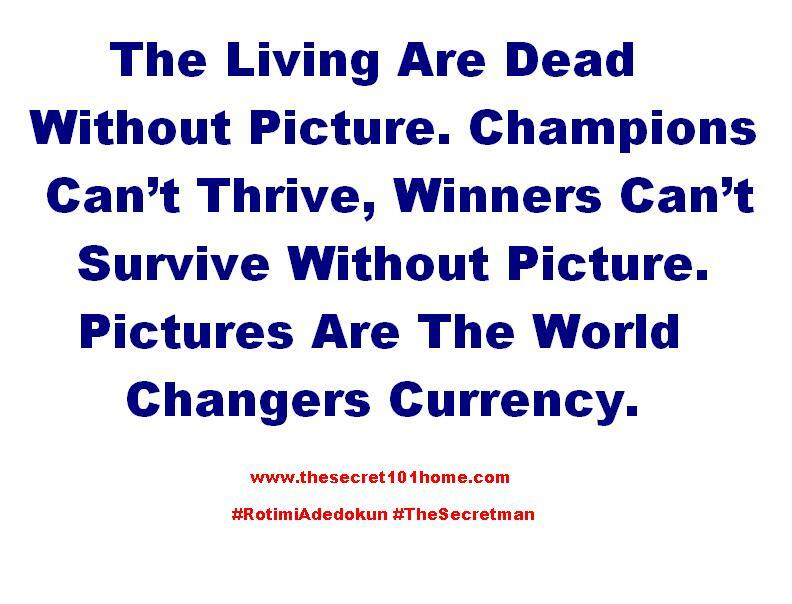 Champions Can’t Thrive, Winners Can’t Survive Without Picture. Pictures Are The World Changers Currency. The Clearer And Bigger The Picture, The More Powerful The Reality. Picture Has Capability To Create Whatsoever You Can See. Picture Says I Will Give Exactly What You Can See. To Live In Mansion, You Have To See The Picture. One Word, Express In One Hundred Words In One Hundred Days. …be inspire, live abundant life, help others. This entry was posted in Life and Time Management, Self Development, Spirituality, The Peace, The Secret, Vitamin Of The Mind, You! and tagged Bishop David Oyedepo, How to Picture The Future, Jim Rohn, Pastor E A Adeboye, Picture, Rotimi Adedokun, The Scripture. Bookmark the permalink.